Discussion in 'K-POP' started by lookliz, Jun 25, 2018. Want_Some_Milk, kpopact, JakeyWantsCakey and 22 others like this. sugakookies, Priyanshu07, JakeyWantsCakey and 3 others like this. JenJennie7, NoCookie90 and Chaittra like this. TT did it against PWF and 11:11. Antoglou and borabora_97 like this. Priyanshu07, JakeyWantsCakey, Hana0127 and 9 others like this. I mean u can see it yourself. Stop being petty. Wow, all hits 2-5 were big hits in korea so we can see that this song will be a nation hit or maybe already is. The impact is big. JakeyWantsCakey, Hana0127, JenJennie7 and 1 other person like this. That's weird cuz TT didn't get a single PAk after PWF/11:11 were released. dontmindme2, kpopact, Priyanshu07 and 10 others like this. kpopact, JakeyWantsCakey, PurpleForLisa and 10 others like this. what does an empty house mean? Dude I don't care. Pak is all about competition. Me Gustas Tu have no paks. Boom Boom have no paks. But it needs to be mentioned when Ikon and BP are robbing empty house. what is not an empty house though? TT came out a week before PWF and 11:11 came out around 2 weeks after TT. So TT had a week of empty house - literally empty house to get PAK. michellesong, jenstals, sugakookies and 3 others like this. jenstals, JenJennie7, kashchanocchi and 1 other person like this. Hana0127, JenJennie7 and Chaittra like this. Why are there only 2018 songs in this? Weren't there ranking before 2018? Congratz on the PAK Hours(?) BP. Show me receipts. And there was IoI anyway. See no PAK for TT 1 day after PWF/11:11 came out. Class dismissed. PurpleForLisa, violetmoon, Rhodonite and 2 others like this. It is funny when you mention boom boom doesn't get pak and IKON empty house tho. You said it is about competion. It just prove that it can't compete Love Scenario. You said yourself. They release on the same month. 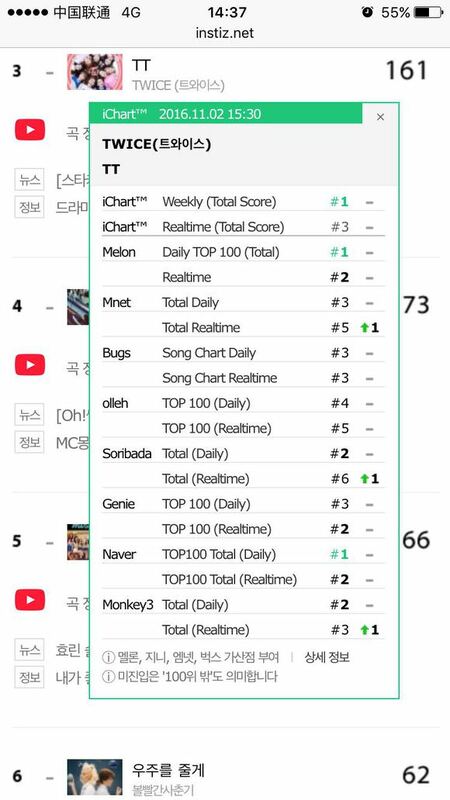 If Love Scenario is weak, and that boom boom is that strong, boom boom should get pak with no problem..
Hana0127, NoCookie90, Chaittra and 2 others like this. Hana0127, Topclass and TaeyangSaved like this. DDDD in day 10 with upper 900K UL is the first time of Melon chart history. Hana0127, lizvip, violetmoon and 3 others like this.